A family gathering of Stephanite – Ag5SbS4 – a black and rather plain silver mineral. From the left, a single crystal from Pribram (crystal is 4.5 cm high, scale for other specimens), a cluster of bright crystals from the Husky Mine, Yukon, Canada, and dozens of prismatic crystals on matrix from Joachimstahl, Bohemia. I have been collecting minerals for 54 years, and in that half century there has been a dramatic evolution of the “mineral hobby”. Perhaps this evolution is normal, but today the hobby is barely connected to the rock hound roots of my past. I was recently offered an incredible (a more descriptive adjective would be “obscene”) sum for one of my mineral specimens. The dollar amount was more than 3 times the annual salary I drew when I started as an assistant professor at the University of Arizona in 1983. Rather than being pleased with the offer and congratulating myself on the thoughtful investment strategy I must have concocted all those years ago, I was despondent. The collector persisted, and told me the “specimen was a masterpiece, a work of art”. Art! Indeed I collect minerals because they are meaningful artifacts – the perfect combination of science, human history and perfection in nature, but the way the term “art” was being used reduced the specimen to the calculus of trophy hunting. My depression was an expression of the culmination of frustrations and fascinations with the changes in mineral market I have observed. In the 1960s and early 70s most minerals were within the economic reach of a dedicated mineral collector. There was a “top end” to be sure, and certainly many minerals fetched prices that exceeded the cost of a new automobile. However, there were many collectors that built incredible collections on a bargain budget. These collectors were driven by a passion I can relate to – most were very knowledgeable about mineralogy and had a rudimentary understanding of the geology. In the early 1970s there was a strong push by a group of mineral dealers and curators to describe some minerals as “natural works of art”. 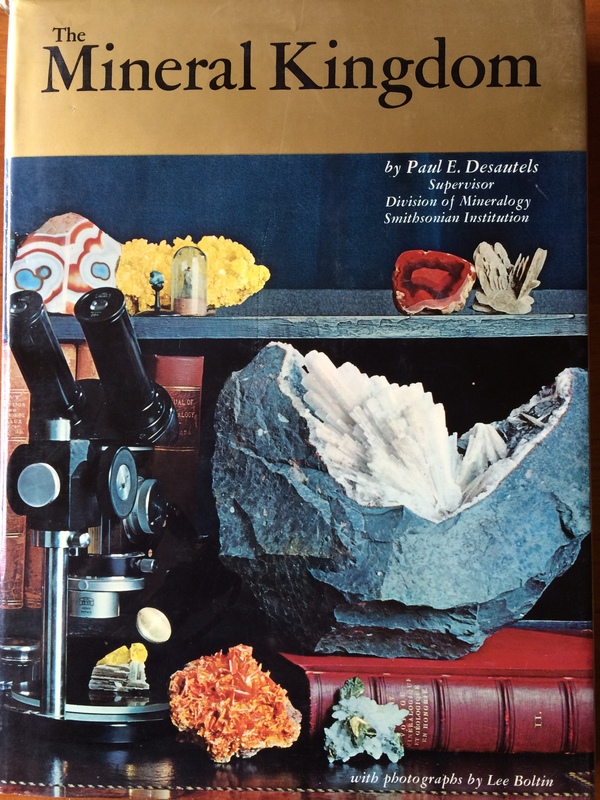 Paul Desautels was at the vanguard of this movement, and in 1968 he published The Mineral Kingdom, which is arguably the most influential mineral book in history. The Mineral Kingdom – a remarkably influential book published by the curator at the Smithsonian in 1968. Although perfection and beauty in mineral specimens had long been sought, The Mineral Kingdom laid out why mineral specimens should be thought of as art. I received a copy of The Mineral Kingdom for Christmas in 1970. I loved the book (still do) – it has chapters on the science of minerals, the history of minerals, famous localities and countless historical drawings and photographs. 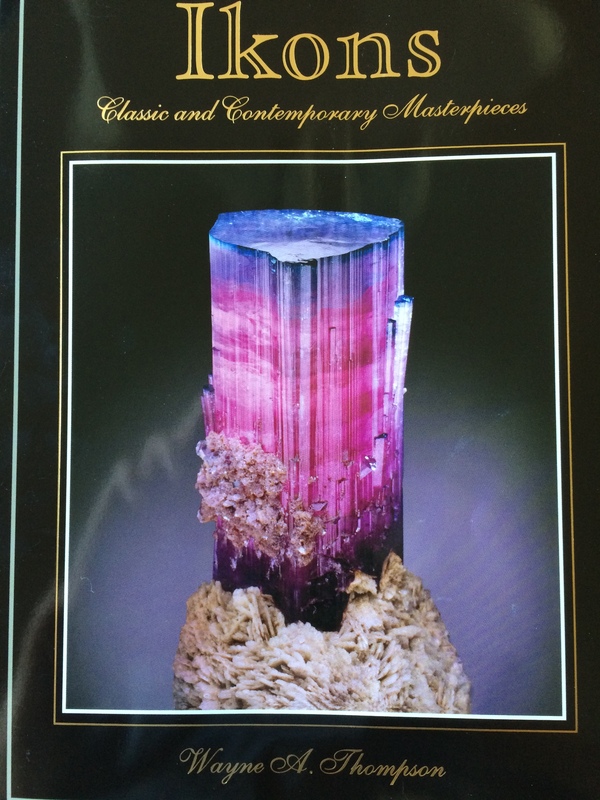 It also has chapters entitled “Mineral Masterpieces” and “The Connoisseur”. The opening soliloquy of the chapter on Mineral Masterpieces: “Classic mineral specimens, like great works of art, achieve their status through experts’ judgments”. This sentence is, of course, 100 percent factual – and I would be very hypocritical to suggest that I don’t covet, pursue, and cherish mineral masterpieces. However, this tie to art has driven the mineral market in the last 40 years in ways that are not healthy. In the art world the top end of the market seems to have little relationship to driving prices and value at the low end of the market. That is not true in the mineral collecting world – prices for top pieces provide justification for pricing lesser specimens. The conversation goes like this: I saw a Kongsberg silver wire that was just sold for $300,000 dollars, therefore this lesser Kongsberg must be worth at least $40,000! In the art world no one says that a 25 million dollar Rembrandt sketch of a smiling woman means that similar drawing by Elmer Fudd justifies a price of 1 million dollars. In my opinion mineral collecting in this era of “minerals as art” has made minerals much less accessible to beginning collectors and those of modest means. The market place is still adjusting, and Darwinian forces will most certainly win out. Luckily, there are still some minerals that have resisted the art trends — mostly very common minerals, very rare minerals, or those that are considered “ugly”. Being a silver collector I am fortunate that some of the silver species fall in later two categories. One of these is stephanite – and as Einstein notes, it is mysterious mineral, at the intersection of science and art. There is a vast body of literature devoted to the psychology and motivations of collectors of high priced art. In truth, art collectors are probably not a lot different that collectors of “any objects” – baseball cards, model trains, stamps, coins, etc. However, there is a special aura associated with art collecting. In November, 2013 Christie’s auctioned the Francis Bacon painting “Three Studies of Lucian Freud” for $142.4 million dollars (there are rumors of private art sales for even more – $250 million for a Cezanne in 2011, for example). To me, the Bacon painting is just flat; it does not move me in any way. Francis Bacon’s Three Studies of Lucian Freud, painted in 1969. Christie’s sold the painting in auction for more than 142 million dollars, which 7 bidders competing for the right to own….these three panels. 142 million dollars? Those that analyze the art market claim that the value is driven by both passion and competition. The passion is easy to understand, but it is the competition that propels the price sky high. Competition in this case is not the same as demand for a rare resource, although that is a factor. Rather, the competition is about denying others the trophy. This lust for winning strikes a deep nerve. The ultimate trophy is an important aspect in mineral collecting today. In 2012 the Economist magazine profiled several studies on the art market, including a Barclays Bank report entitled “Profit or Pleasure? Exploring the Motivations Behind Treasure Trends”. The report interviewed 2000 art collectors and dealers (all very rich people) from 17 different countries, and found that this rich clique had a strong sense of community. The collectors, and dealers that cater to them, shared that buying art engendered feelings of victory, cultural superiority and established a badge of social distinction. The sense of community also leads to mechanism of validation – these collectors want what the other collectors want, and were actually quite conservative in branching out on their own, and rarely are trend setters. Art Basel is an annual art fair in Switzerland that is sort of like the annual Tucson Gem and Mineral Show. Some 300 plus very high end galleries put on a show that is a “do not miss” event for collectors and museums. In the Barclay report there were a number of dealers that talked about their strategies for selling their wares. They often make a list of people they think would be a “good home” for a piece of art, and then show the piece only to those queued on the list. Collectors that have a piece reserved for them personally are nearly twice as likely to buy the art work than if it is openly displayed in a gallery. This last year Art Basel tried an experiment of opening the art show early to select “VIPs”; lesser VIPs had to wait a few hours before they could buy. Predictably, the lesser VIPs were angry – mostly about their demotion in status. Ikons, a 2007 publication by mineral dealer Wayne Thompson, was a tribute to minerals as art. Thompson makes the argument that visual presence of certain specimens makes them “ikons” — as the art standard for the mineral community. The description of Art Basel could easily be Tucson if the words “art works” and “mineral specimens” are interchanged. Today the highest end mineral specimens are sold at “pre-show” gatherings at resorts like Westward Look. The well healed arrive a week before the main show in downtown Tucson, and visit the pre-shows. They ask if dealers have anything set aside for them – and the successful dealer always has a stash hidden away, under the bed or in the bathroom, that is just to be viewed by the preferred customer. The “lesser collectors” (people like me – knowledgeable but never a VIP) then can browse the more modest minerals on the shelves of the display cases. I am told that the preferred customers account for 10 percent of the sales in volume and 75 percent of the monetary value. In 2007 Wayne Thompson published a special volume in the Mineralogical Record. This volume was called Ikons – Classic and Contemporary Masterpieces. It is a homage to minerals as art, and makes the point that iconic specimens are as important at art masterpieces. However, there is a huge disconnect between pricing for mineral masterpieces and lesser specimens. It is always difficult to know what an “ikon” has sold for — rumors help drive up prices — but a simple example illustrates this dilemma. The Aztec Sun – legrandite — as displayed in the MIM museum in Beirut. This is one of the world’s most famous mineral specimens, and now is a standard for comparison for all legrandite. One of the most famous mineral specimens in world is the Aztec Sun – a spectacular spray of lemon yellow legrandeite from Mapimi, Mexico. Today the Aztec Sun resides in a fabulous museum, MIM, located in Beirut, Lebanon. This specimen use to be in the Miguel Romero mineral collection, and I had the honor of curating the Romero collection for 5 years. When it was decided to sell the Romero collection this piece was the subject of much angst on pricing. How much was it worth? I don’t know what the actual selling price was, but the rumor was 2 million dollars. It is about 20 cm high, and really, a rather simple mineral; (Zn[AsO4] [OH].H2O). The rumored sales price reverberated through the mineral community, and I know of at least 3 cases where a mineral dealer raised their prices on the legrandite specimens in their stock — in one case the repricing was an escalation by a factor of 3! Why? The specimen that suddenly carried a hefty price tag was hardly the Aztec Sun; in fact, it was a rather unremarkable 4 cm cluster of slightly damaged crystals on brown limonite matrix. A decade later that specimen is still for sale, although now only twice its original price tag. This dragging up in value of lesser specimens by the sale prices of the “ikons” is a perplexing problem in the mineral hobby. It seems to suggest that a mineral species or its locality is the equivalent to a named artist – i.e., legrandite = Van Gogh. It is difficult to know what the market trend will be for minerals – will they become mineral specimens again, or only works of art? 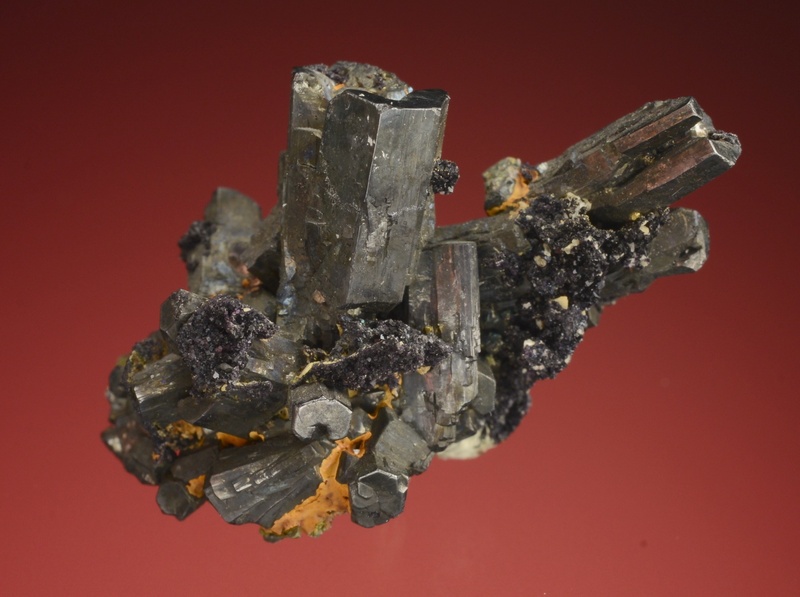 Stephanite is one of the four “common” silver sulfosalts – the others being polybasite, pyrargyrite, and proustite. 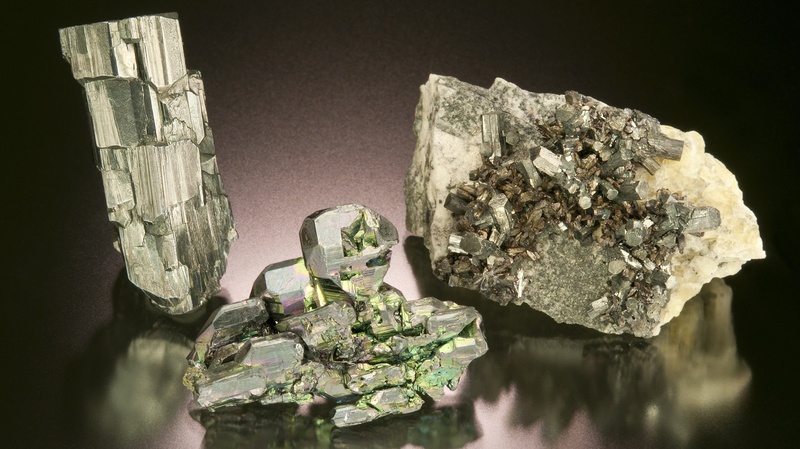 Stephanite is known from hundreds of localities, and in the past was a very important ore of silver (in fact, stephanite along with acanthite, was the primary ore at Comstock Lode in Nevada where 200 million ounces of silver were produced). 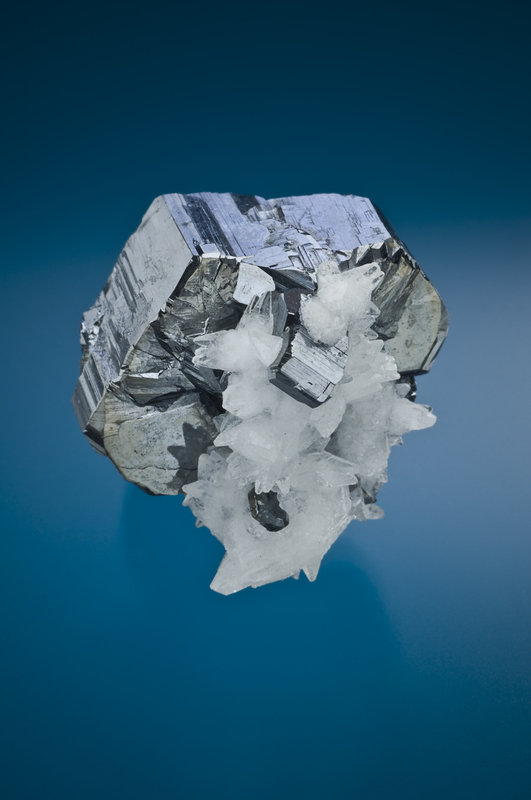 Despite its relative abundance and chemical kinship to the other more highly coveted silver sulfosalts, stephanite is hardly ever considered a “classic”. A picture of stephanite has never graced the cover of Mineralogical Record, and it does not even get a tiny shout-out in Ikons. 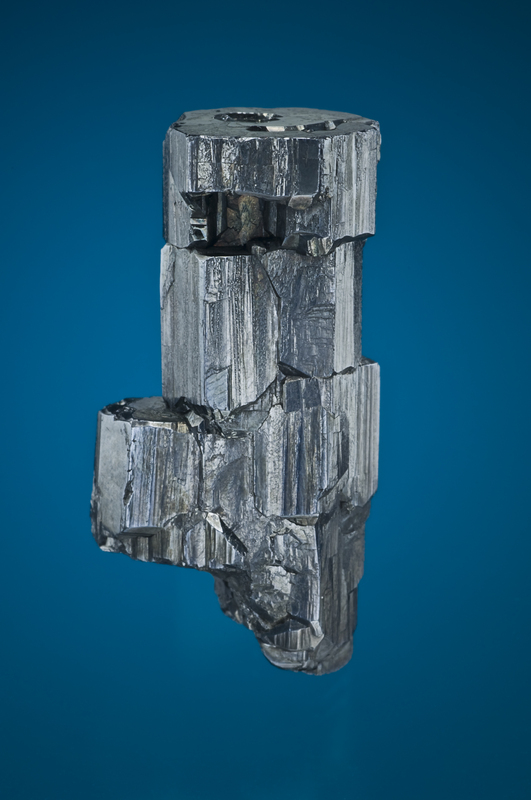 Stephanite is black, rarely lusterous, and mostly found in small crystals. However, it is a mineral with a rich history, and is an important artifact from every historic silver mining camp in the world. It well may be the antidote to minerals-as-art movement. Stephanite is where I find my Zen. 4.5 cm tall crystal from Pribram, Czech Republic. Jeff Scovil photo. If there was a “world class” stephanite it would probably be the crystal pictured above from Pribram, Czech. The crystal is of extraordinary size for the species, and a bright luster. The mines of Pribram are quite ancient – silver mining is known here from the 13th century. During the 19th century the Pribram mines were some of the most technologically advanced in the world, and were the first to have shafts that descended 1000 meters below the surface. The best silver species specimens were mostly mined before 1860, and are very well represented in the Narodni Museum in Prague. The pictured stephanite is the best I know of, although it is difficult to document its lineage. Below are the mineral labels still with the specimen; it came to me through Gene Schlepp. 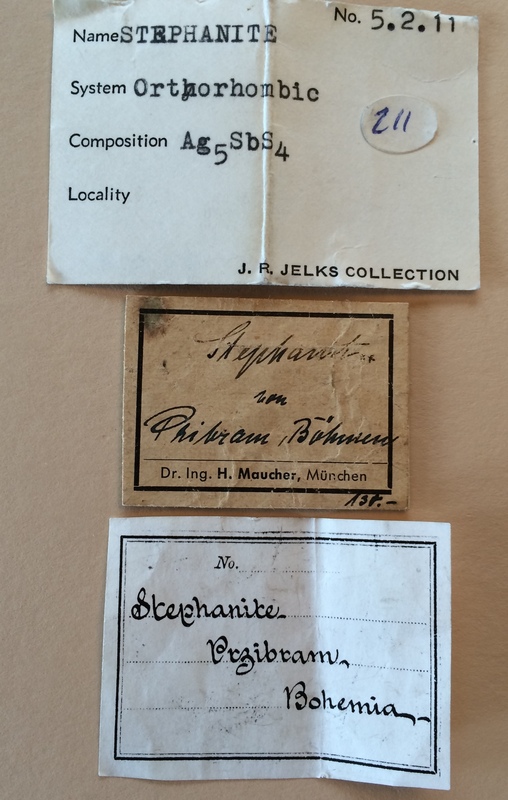 Labels for the Pribram stephanite. The H. Maucher label most be from the late 1930s. Rukin Jelks (who was a very highly regarded southern Arizona collector) was the last owner before passing the specimen through Western Minerals in Tucson. The common silver sulfosalts are part of a group of complex chalcogenides with a chemical formula AxBySn where A = Ag, B = As, Sb or Bi, and the S is sulfur. For stephanite the formula is Ag5SbS4. The fact that polybasite, proustite and pyrargyrite are part of the same group means that they all have similar properties structurally – and which of these mineral forms in a geologic environment mostly depends on temperatures and pressures. In almost all cases, the silver sulfosalts form in epithermal veins – hydrothermally driven fluids. Stephanite is the last of these minerals to precipitate out of solution – in fact, stephanite is not stable above 197 degrees C. Above this temperature stephanite decomposes into pyrargyrite and acanthite. Stephanite on polybasite, Fresnillo, Zacatecas, Mexico. 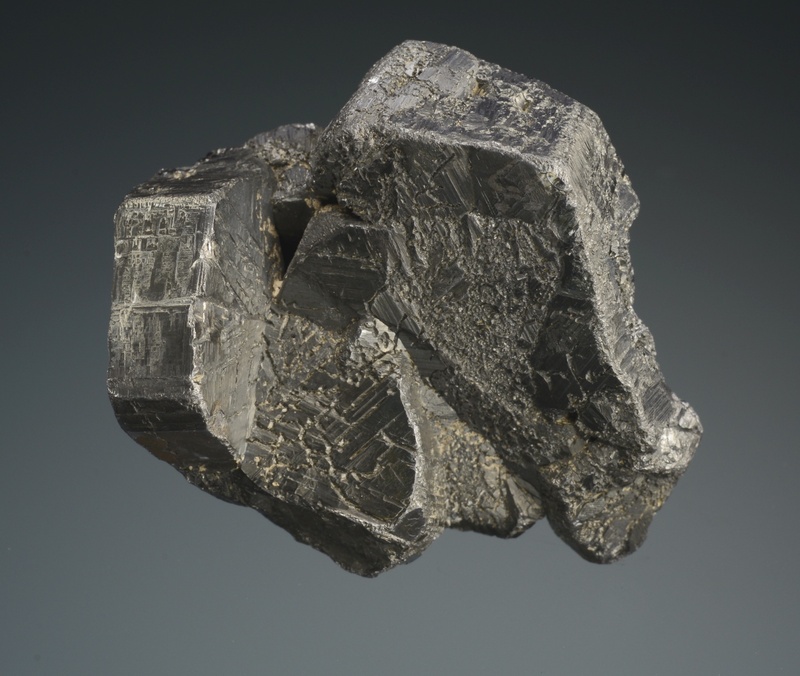 The stephanite is the last silver mineral formed in most epithermal silver veins. The specimen pictured above documents the paragenesis of stephanite from Fresnillo, Zacatecas, Mexico. The core of the specimen (with is 3.5 cm high) is a polybasite crystal. Sprinkled across the polybasite are stephanite crystals which grew on the polybasite as the vein fluids cooled. Fresnillo is an amazing silver deposit, and source of some of the very best silver sulfosalt specimens in existence. Mining at Fresnillo dates from Spanish Colonial time, although few specimens survived before the mid 1970’s. Fresnillo is often mentioned as an important silver district in historical literature, but it really was quite unremarkable. The district was nearly abandoned in the 1970’s, but a desperation drilling program discovered a blind vein system a couple of kilometers southeast of the main workings. These veins average 800 g/ton of silver, and occasionally grade to 2000 g/ton. Seams of solid pyrargyrite 35 cm thick have been reported and individual crystals more than 10 cm in length have been collected. The district has now produced more than a billion ounces of silver (Kongsberg only produced 43 million ounces of silver! ), and exploration in the surrounding region has located huge reserves. Many of the best specimens came out in the period of time 1992-1999; I was extremely fortunate to have seen most of the best material, and acquired the core of my collection from Dave Bunk during this time. Stephanite was first mentioned in literature in 1546 by Georgius Agricola. Agricola, born Georg Bauer, is the “father of mineralogy”; he was the town physician at the Bohemian mining center of Joachimsthal, and wrote extensively on the geology of the region. In his 1546 text De Natura Fossilium Agricola described the mineral as schwarzerz in reference to its black color. 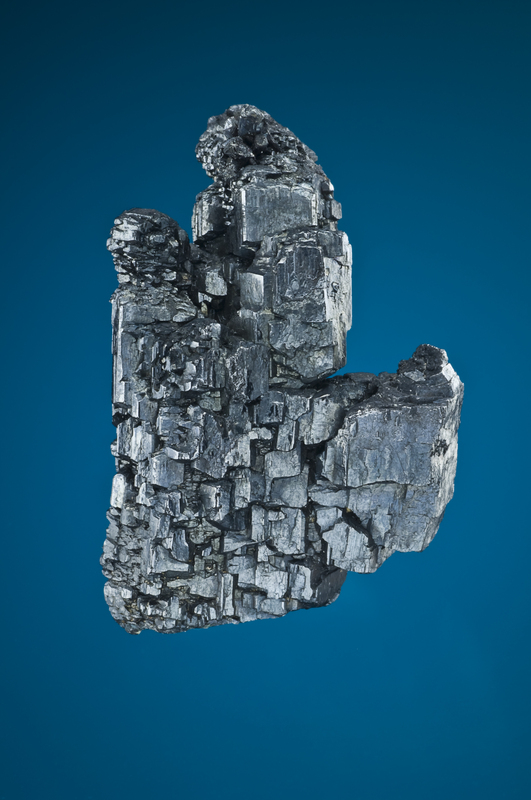 It is later referred to with various names – both in latin and german – as black silver ore and brittle silver ore. In 1845 Wilhelm Haidinger proposed the modern name of stephanite in honor of the Archduke of Austria, Stephan Franz Victor. Archduke Stephan was one of many nobelmen of the time that built “natural history cabinets” — however his was just extraordinary! He acquired more than 20,000 specimens, mainly from the mines of Bohemia. When he died the collection went to the House of Oldenburg. Much of it was sold, but some of the specimens remain in the Natural History Museum in Berlin. The Archduke’s labels are distinctive, and much coveted by mineral collectors today. A complex cluster of stephanite crystals from Freiberg, Saxony. The specimen is a little over 5 cm tall. The specimen was originally in the Archduke Stephan collection, and has passed through at least 5 collections before coming to me. Stephanite belongs to orthorhombic crystal class, although twining on the prism planes is extremely common giving rise to pseudo hexagonal crystals. There are three dominate habits for stephanite: (1) thin, hexagonal plates that can be as large as the size of a US quarter, (2) elgonated hexagonal prisms (like the Pribram stephanite pictured above), and (3) tubular clusters of crystals that form branching clusters. 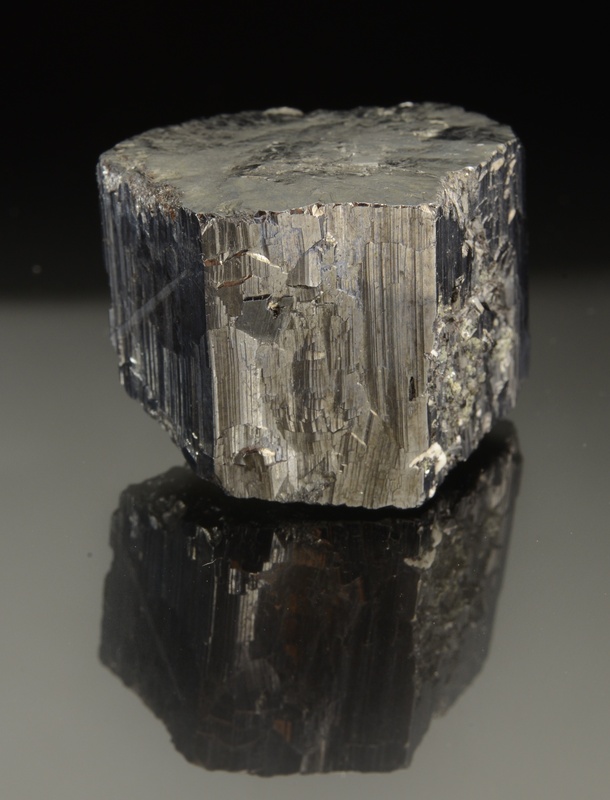 Stephanite is iron-black in color and sometimes has a bright luster. There are numerous mineralogical texts that claim the bright luster will dull with exposure to sun light, but I have no evidence of that, nor do I know what the physical mechanism would be. 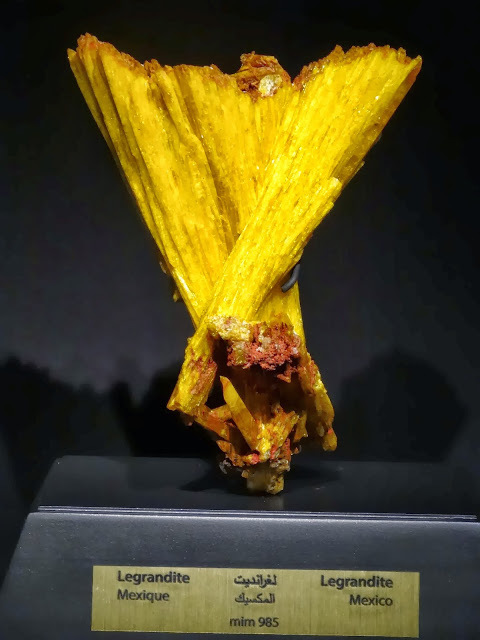 Stephanite prism, Fresnillo, Zacatecas, Mexico. A classic pseudo hexagonal prism, 2.7 cm tall. Some of the very best stephanotis ever recovered came from Fresnillo in the late 1990s. Jesse La Plante photography. The largest stephanite known are from a modest mine, the Las Chispas, located near Arizpe, Sonora, Mexico. The production history of the Las Chispas is mixed; it was interrupted by revolution, strikes and seizure. The total silver produced probably did not exceed 20 million ounces of silver, but a very enlightened mine manger, Edward Dufourcq collected specimens and the mine owner, Pedrazzini, donated many to the Columbia School of Mines. 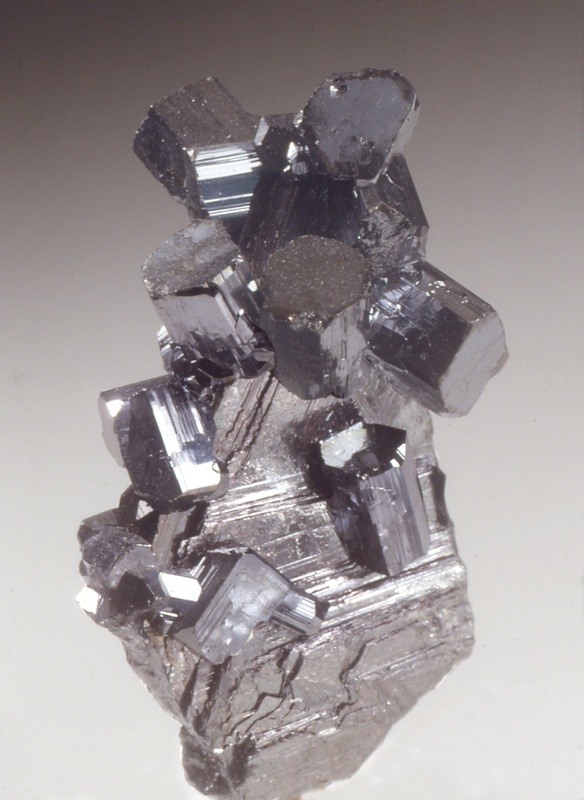 Dufourcq wrote the following in an article published in 1910; “The crystallized specimens of the silver minerals are especially noteworthy….What is probably the largest single specimen of stephanite in the world was presented by Mr. Peddrazzini to the Egleston collection at the Columbia School of mines, where there are also a number of other specimens of polybasite and stephanite, as well as a remarkable specimen representing the transition of an argentite crystal into cerargyrite and a fine embolite. The American Museum of National Hisotry in New York also has, from this mine (the Las Chispas), what is probably the largest mass of polybasite crystals ever taken out in one piece. This originally weighed over 65 lb., but was broken into two parts during the time it was in transit from Sonora to New York”. When I was curator at the University of Arizona Mineral Museum we received one of the two pieces of the “65 pound” polybasite crystal group in trade – it only weighed 13 pounds! The stephanite groups are smaller than the polybasites, but still giants for the species. The largest I know of is a cluster of crystals 12 cm across. The photo below is a very large crystal group in my collection. Stephanite, Arizpe, Sonora, Mexico. A large cluster of crystals from the Las Chispas mine; the specimen as displayed is 6.8 cm across. Jesse La Plante photograph. Stephanite has always been a favorite of serious collectors, even if it is not in “art world”. Below is the mineral advertisement from the Foote Mineral Company of Philadelphia. Albert Edward Foote, who arguably is the most famous mineral dealer in American history, sold minerals from 1875 until his death in 1895 (the company passed to his son, a good dealer in his own right, and then to others and still exists today). 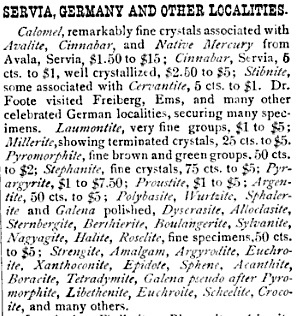 The ad below includes a reference to “Stephanite, fine crystals, 75 cts to $5″ from Germany. Mineral advertisement from A.E. Foote Minerals published in 1894. The stephanite specimen pictured below was one that was sold with this ad, and costs $3 dollars 120 years ago. I bought a stephanite in 1988 (pictured below) that came with a photocopy of this ad, and a note that the specimen was purchased from the ad for $3 dollars in 1894. It is impossible to confirm that this is indeed true, but it does provide a fanciful barometer for price increases. I bought the specimen for 450 dollars – which translates into an escalation of a factor of 150. There are many “inflation calculators” that can help give a sense of the rising costs overall. These calculators say that consumer goods have increased by a factor of 20 over in the last 100 years (averages 3% a year), thus stephanite has been a “good” investment. But the 3% annual inflation is highly misleading – some commodities have increased in value and others have dropped tremendously (for example, the cost of electricity). Another way to compare the value of the price increase is to compare it to a specific commodity through time. For a mineral collector the perfect barometer is the cost of a pint of beer (mineral collectors, in general, think in terms of specimens and beer). Using the average price for a pint of beer in a bar in New York City in 1900, and again in 2000, the cost increase was a factor of 180 (data from the Economist). In other words, stephanite prices have not kept up with the price of beer. This truly means that stephanite is not art! Stephanite, Frieberg, Saxony, Germany. A large thumbnail, originally bought from the A.E. Foote mineral company in 1894. Jesse La Plante photograph. There are a number of ways to evaluate the value of a mineral specimen. These include rarity, locality, pedigree, and aesthetic beauty. Beyond the specific character of an individual specimen, it can have value as part of a collection, documenting the nature of a particular mine or geological deposit. Unfortunately, the evaluation criteria are highly subjective and subject to changes in mineral availability and popular notions of aesthetic beauty. In the last 20-30 years the “masterpiece” or trophy mineral has dominated the pricing paradigm in the hobby, and dramatically skewed the sense of worth. Wendell Wilson and John White (1977) conducted an experiment in specimen appraisal by asking a group of museum curators, collectors, and mineral dealers to estimate the cost of ten different mineral specimens. The survey was conducted twice, four years apart. Although the time separation was too short to gauge slowly varying trends (like specimen size), it did capture the strong trends in trophy hunting. During this four-year period the average mineral specimen increased in value by 190%! Although not immediately obvious, this dramatic increase caused a cosmic shift in mineral dealing. Dealers began to view specimens as an investment and certain new collectors demanded a high rate of return. Those dealers that understood the trend were able to adapt the business practices of the art market. However, this adaptation had some very unexpected consequences – all mineral prices became pegged to the highest priced trophies. This meant that “esthetic” but otherwise unremarkable mineral specimens rose in marketing value at an unprecedented rate. By the early part of the 2000s large numbers of collectors had either stopped buying, or were now buying specimens with much less frequency. Today, the mineral collecting hobby is changed – and will continue to change — and is no longer the bastion of “rock hounds”. The question I am most frequently asked today is “how much is that worth”. Almost never am I asked about why a specimen is important, or why I enjoy it. Fortunately, I can still enjoy my hobby through scholarship, and the pursuit of a few, largely unappreciated species. The Zen of Stephanite. 2.8 cm prism of stephanite with white calcite crystals, from Fresnillo, Zacatecas, Mexico.